Hard water doesn't have to be a regular part of life in Florida. Sunshine Plumbing and Gas provides a number of cost-saving water softening services that extend the life of appliances, clothing, and plumbing. We work with you to find a system that effectively and efficiently meets your home or business’ needs and preferences. Our plumbers have years of experience solving the mystery of hard water in residential and commercial properties in North Central Florida. We have the tools, skill set, and experience necessary to get the most from your water — contact our plumbing repair company today for professional watering softening services. When water is in the ground, it accumulates soluble particles of whatever it passes through, which typically means that the water contains minerals found in the earth. Two of the minerals that make water hard are magnesium and calcium. Since Florida’s underground foundation contains a large amount of limestone, hard water is common throughout the state. When rainfall dissolves the limestone, hard water forms as the dissolved limestone absorbs the calcium and magnesium from the ground. Water softening reduces or eliminates the high mineral content found in water supplies, remediating the negative consequences associated with hard water. What Common Signs Suggest That My Water Needs Softening? It can be difficult to know if you have hard water unless you know which signs to look for. If you notice the following issues with your water, it’s time to contact us for comprehensive water softening solutions with residential plumbing and commercial plumbing services. Calcium and magnesium react with soap and other detergents used to wash clothing. In turn, when the detergent doesn’t thoroughly rinse from clothing, it can increase dirt and grime build-up. Hard water also causes white fabrics to yellow due to the water’s iron content. Hard water makes thoroughly rinsing the soap from your skin a difficult task. As a result, soap residue dries out the skin, leaving you with an itchy feeling. In addition, hard water can exacerbate a number of skin conditions, such as eczema symptoms, especially among children. Hard water frequently causes surface stains on toilets, showers, and bathtubs. Stains typically range from deep red to light brown in color and are due to an excess of iron in the water supply. Stains can be impossible to remove, which is why we also provide bathtub replacements and installations. As the hard minerals and scale deposits build on the inside of your pipes, clogs eventually form. But, this issue mostly affects older steel pipes rather than copper and PVC pipes. Along with water softening, consider scheduling piping services to help keep pipes clog-free. A smell or taste in the water usually means there’s a conditioning issue from hard water or a bacterial contaminant. Excess iron gives water a metallic taste, while sediment in the water can create a dirt-like taste. What Are The Different Types Of Water Softening Systems? Sunshine Plumbing and Gas performs an assessment of your current water and helps you determine which water softening system best suits your lifestyle and needs. There are several types of water softening systems available for homes and businesses, including the following. In a salt-free water softening system, the water’s molecular structure is changed as the water passes through a filtering media. An advantage of a salt-free system is the descaling effect it has on the rest of a home or business’s plumbing due to the water’s new molecular structure. With reverse osmosis, contaminants are removed from the water by forcing water molecules through a semipermeable membrane. Reverse osmosis can remove a wide variety of contaminants, including chlorine, dissolved salts, and lead. This process generally includes at least two filters, the pre- and post-filter, though some systems may use more filters. With an ion exchange system, calcium and magnesium are replaced with hydrogen, potassium, or salt. Salt is the most popular replacement option. This two-tank process begins when water flows through the resin bed in the resin tank, exchanging the hard mineral ions with one of the replacement options. Once the resin bed is saturated, a brine solution flushes through the bed and the hard minerals wash down the drain, completing the regeneration cycle. 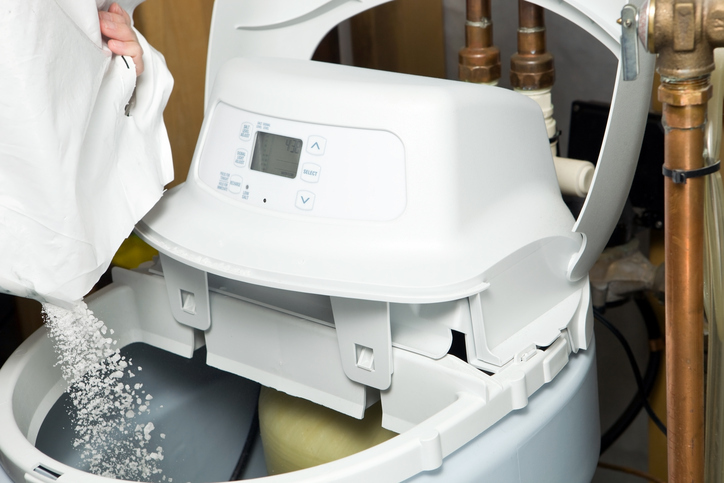 What Are The Benefits Of Water Softening Systems? While hard water seldom causes health issues, it can create uncomfortable and irritating situations, such as frequent appliance breakdowns and clogs, among other common plumbing issues. Here are four advantages of water softening services from Sunshine Plumbing and Gas. Appliances operate more efficiently with softened water than hard water, saving you money on energy bills. Plumbing fixtures, silverware, and any surface cleaned with softened water are cleaner than those cleaned with hard water. Clothing and other fabrics stay soft and last longer without corrosive hard minerals trapped in the fibers. All appliances that use water, such as coffee makers, dishwashers, and water heaters, last longer without mineral deposits.